Before reading the book for the first time, conduct a book orientation with the students. Discuss birthdays and other kinds of parties with the students. What kinds of preparations do families make to celebrate? What animals can you see on the cover? Why do you think the animals are wearing costumes? What is unusual about the pictures on the cover? When continuing the book orientation, flick through the book and point out selected pages, and stop and look at tricky words. Take the opportunity to talk about key vocabulary from the text, focusing on the language used to describe the party. Ask the students if they have ever received an invitation (page 2). Discuss what a grand affair (page 3) might be. Encourage the class to discuss what the description makes them think of and consider synonyms that we might use. Finally, ask the class to make predictions about what might happen in the book based on the first look at the images only. Note these on the whiteboard or chart for discussion after the first reading. After the first reading of the text, encourage the students to share what it is that they found interesting about the book. Write all the answers on the whiteboard or butcher’s paper to refer to later. As a class, jointly construct a text analysis chart to explore connections between The Eleventh Hour and the students’ own prior experiences. This activity is designed to draw students’ attention to the imagery portrayed within The Eleventh Hour and is adapted from Feldman’s Critical Process Model. Before creating the whole class chart described below, draw the students’ attention to the variety of semiotic systems used within the text, such as linguistic – the use of text features; visual – the colours and effects in the illustrations; and spatial – the arrangement of the images on the page. In pairs, students consider the questions below. Description: What can you see in the pictures? Analysis: How does the picture make you feel? Interpretation: Have any parties that you have been to looked like this? Judgement: What else would you like to be included in the pictures? After brainstorming each of the questions above, create a list of what works best in the pictures displayed in The Eleventh Hour. This list will be useful for students to refer back to when they are completing their rich assessment task. To continue with an introduction to the visual aspects of The Eleventh Hour, ask students to describe an invitation that they might create for a ‘grand affair‘. In small groups, students plan their grand affair by thinking about what to write on their invitation, what illustrations or images might be used and what colours will be prominent. Each group could create a collage that shows what their illustration might look like. These plans can be shared, discussed and reflected upon. What could help us to solve the mystery of who stole the feast? Has the author provided some clues in the illustrations? Are there clues in the illustrations that are different to those that are in the text? In small groups, provide the students with a copy of the book open at the double page before and after banquet pages. Encourage students to discuss the similarities and differences that they notice on each of these pages. Returning to a whole class group, discuss the additional clues that Graeme Base has provided in the borders surrounding each page. Allow students to see if they can find the message outlined in the outside border which reads, ‘Can you find a hidden message in every illustration?’ The letter charts on the walls also provide clues to discuss, such as ‘Do not guess’ and ‘Now you see it’. Encourage students to think about what this might be referring to. Further explanation around these clues can be found in the ‘Top Secret’ section at the end of the book. Why has the author included a message in the border? Does the message that is written in the border relate to the story? When exploring the events within the story, a viewer’s circle technique will assist the students in guiding their investigations. A viewer’s circle allows for a structured approach to exploring the text, by talking about which parts of the illustrations and text students will be focusing upon in order to answer the question presented. A discussion manager leads group discussions. Modelling the roles and execution of a viewer’s circle clearly will be essential to allow children the opportunity to practise identifying each aspect of the text. The viewer’s circle structure provides a great opportunity for students to explore the nature of the mystery in The Eleventh Hour. Following on from the previous activity, each group is allocated a double page spread to try and locate clues to the mystery and note these down on small whiteboards. After each viewer’s circle has crafted a list of possible clues, they will share with the whole class. A whole class list of clues can be jointly constructed on the interactive whiteboard. These possible clues will be used in the rich assessment task for this focus, by providing the students with a list of possible suspects. As a concluding assessment activity, encourage the students to discuss how and why we make decisions about what we do. Guide students in discussion about how each of the decisions that we make can be because of the way we felt at a particular time. These discussion topics are designed to get students to think of what the character’s motivations might have been for stealing the feast. Ask students to think about which character might have had the most to gain from stealing the feast. Children can develop a list of possibilities together with a list of questions and hot seat various characters to help them refine their theories. Ask students to decide which character they think is most likely to have stolen the feast. The character that the children choose could be the actual thief, or another character. Ask students to write a short letter to Horace as the character that stole the feast, explaining the reasons for their decision. The list of possible theories constructed earlier may assist students with the vocabulary needed to construct their letter. Students can share their response with a small group, or the class. 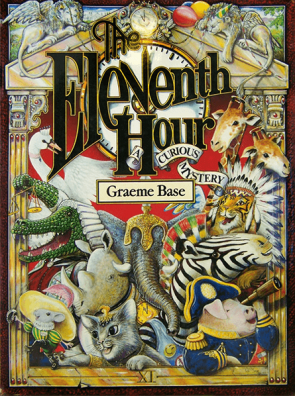 Before re-reading the text with the whole class, discuss some of the tools that Graeme Base has used throughout the book to give the reader clues as to what is happening in the story. Students may suggest that clues are found in the text itself, the colour and style of illustrations and sometimes the inclusion of hidden clues. When sharing the text with the class, ask students to keep an eye out for any clues that tell us what time of day it is as the story progresses. 8.00 am – Horace wrote a list of friends to invite to his party. 4.30 pm – Horace started cooking the feast. After brainstorming a class list, students in small groups could create their own timeline of events for a party, a special event, what they did on the weekend, or what they have done that day. To develop vocabulary skills for describing and comparing, model how to compare and contrast images. Using two sets of pictures, one a page from the text and one a real life shot of animals, model how to compare and contrast features. A suggested page may include the double page spread of Horace and his friends playing tennis, accompanied by pictures of an elephant, a tiger, a swan and a crocodile. What differences do you notice between the real life pictures and those created by the author/illustrator? Why did the author illustrate the animals in this way? A swagger in his footsteps and a twinkle in his eye. And since no one had won at all, they settled on a draw. A concluding discussion to this activity could be centered around how the students may use pictures to enhance the messages that they present in their writing. Further discussions may include creating a list of features that authors and illustrators use to add emphasis to their writing. Further exploration of Graeme Base’s other works such as Uno’s Garden and Animalia could assist in the construction of this list. As an assessment task for this area of focus, ask the students to share what it is that they have had to do in order to understand all of the information that the text had to share. Possible answers from students may include, reading the text, looking at the images, seeing what clues were present in the colours and illustrations, looking closely at the borders of each page and reading the top secret information section provided by Graeme Base at the end of the book. Following this discussion, ask the students to create a ‘code-cracking’ sheet that a reader could use to figure out who stole the feast. This activity would be great for a buddy class, as the older students could assist their buddies to access the top secret information in the back of the book. Students could create a code-cracking sheet for just one page of the text and put this together as a whole class code-cracking manual. What characteristics their puppets have? What is the personality of the character depicted like? What does the character sound like when they speak? Is the character’s voice loud or soft? Does the character speak fast or slow? After practising with their puppet’s voices and personalities, in small groups students can script, rehearse, perform and record a readers’ theatre with parts of the book over several sessions. The script could be rehearsed and then finally recorded so that children can listen and reflect on it and re-record if needed. When the puppet performance occurs the children can play the recording and focus on their puppets. One member of the group can record the performance on an iPad, so the performance can be watched afterwards. For this activity, read Animalia also by Graeme Base to the class. After the first reading, ask students to identify the similarities between this book and The Eleventh Hour. Create a class list of similarities, highlighting the use of language, vocabulary and illustrations. Ask students to brainstorm all of the characters in The Eleventh Hour. Select one of the characters and create a whole class character description in the style of Animalia, using descriptive words that begin with the same letter as the character’s name. Using the interactive writing technique, model the brainstorming, drafting and revising stages of the writing process. In the revising stage, encourage students to think of different types of describing words that are more complex. In preparation for this activity, cover the text on each page with a piece of paper or a sticky note. Encourage children to tell the story through the illustrations only. As a class, select the ‘sack race’ page to jointly construct two sentences that describe what is happening. Model a number of different sentences, some that simply describe, some that rhyme in a similar way to the story, or some that include direct speech from the characters. Links could be made here to the clocks as discussed in the ‘Examining Literature’ tab. Students could suggest how else the author could have portrayed the passage of time through the story. Students could then incorporate these suggestions into their piece of writing. In pairs, students select a page from The Eleventh Hour and cover the text. The pairs can use the illustration as a base to construct their writing. Students then draft and create two sentences to describe what is happening in the illustration in a narrative style. The completed text could then be assembled into a timeline of events as they happen in the story. As a concluding activity to the use of The Eleventh Hour, students will use the puppets that were created earlier to craft their own interpretation of the book, or what might happen after the book is finished. In a small group, students decide which character they will portray. Each group can decide whether to act out the original scene in the illustration, perform their interpretation of the story, or act out what happens next. In order to support students to feel comfortable presenting their puppet play they could perform initially in front of one other small group, with groups being given the opportunity to perform for the whole class. As in the earlier activity, the performance could be recorded on an iPad to allow students to watch afterwards. Explore Graeme Base’s website including the apps available. The Graeme Base Educational Suite provides free information for teachers. The Eleventh Hour pages. These will be useful to display on the interactive whiteboard to enlarge the pages for some of the activities. YouTube interview with Graeme Base. Drawing with Graeme Base on ABC Splash. Ryan Spencer is an experienced primary teacher, school leader, researcher and university lecturer. Ryan is passionate about developing strong and resourceful literacy educators that reflect and evolve their teaching to meet the individual needs of their students. Ryan has worked as a Literacy Advisor in the UCAN Read Literacy Intervention Program where he assisted reluctant readers and their parents to rediscover the love and joy of reading through resourceful and sustainable reading strategies. Ryan currently works as a Clinical Teaching Specialist in literacy education at the University of Canberra, tasked with equipping preservice teachers with effective literacy teaching practices. He is currently studying his PhD through the University of Wollongong, investigating the effect that family literacy practices have upon summer reading loss. Ryan is the ACT State Director of the Australian Literacy Educators’ Association.